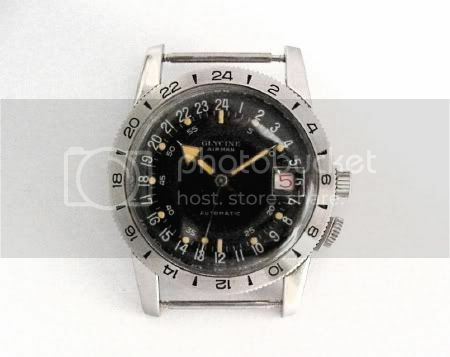 After seeing Nemo's Bulova it reminded me that I was thinking about a 24 hr watch as next month's purchase. 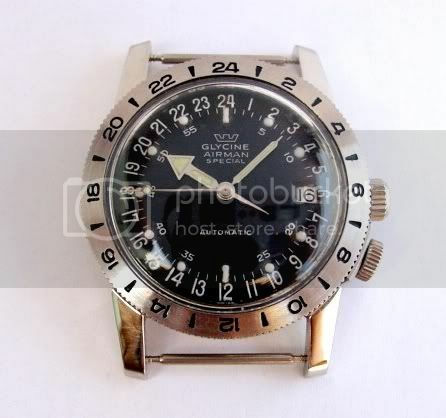 Thanks to Al's Military links post I found Hyunsuk's gallery which shows the O&W Early Bird and the early Glycine Airman. 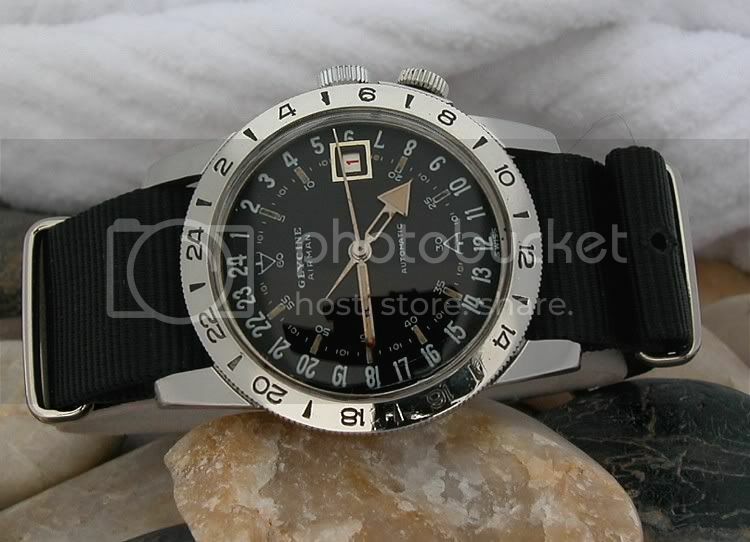 I am enjoying collecting military aviation watches at the lower end of the market whilst awaiting the Bremont MB. The idea of a NOS Early Bird quite appeals compared with the risk of being caught by a fake early Airman. Does anyone have experience of an Early Bird? Does anyone know if the differences between the Special and the early Airman were more than cosmetic? Guess I'll probably end up with both eventually. My Bremont has a 24hr hand, don't know if I could cope with a full blown 24hr watch though.. 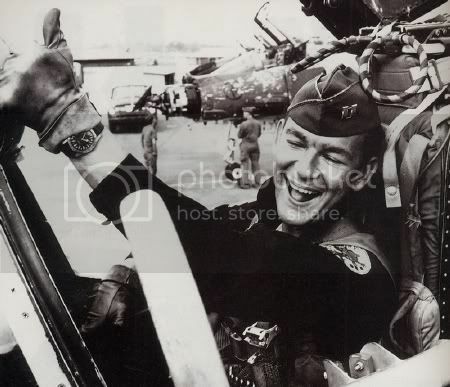 Always thought that the Airman was interesting though and the Breitling Cosmonaute. You know that is one of mine right? That's interesting - the case, minute and second hands plus crown are different too. Let me guess - did the urban myth about these Early Birds being worn in Vietnam start around the same time that the "NOS" versions appeared? Looks good Jon' - if you can find a good specimen, what's to lose? PS - Isn't one of the other forums planning an 'hommage' to the Early Bird? Ollech & Wajs or Ollech & Wajs? Hello. This is my first post on ATG, and I'm glad to have found it. I'm looking for information about the Early Bird if anyone has it. 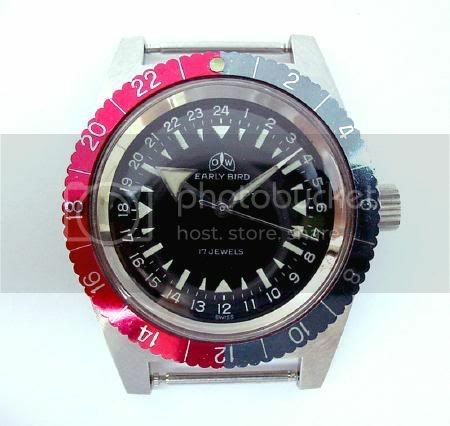 I have the same Early Bird variant as ATG's, with the different bezel, crown, and hands. The major mystery to me is the spelling of Ollech & Ways on the bridge. I've been searching for information on this and was in my watchmaker's shop today. He is Swiss born and his mother-in-law is born and raised in Basel, Switzerland. Thank goodness his wife walked in with coffee while I was there, since her take on the Wajs/Ways thing was that these are essentially synonymous words with alternate spellings. She told me that her mother, who was born in 1929, wasn't even taught the letter Y because it doesn't exist in the Basel dialect of the German language. Learning English was a confusing thing for her where J and Y were concerned. So her working theory was that the particular watchmaker who did the engraving was simply using a spelling of the name that made sense to him. There are other differences. The use of "WATERPROOF" instead of "WATER PROTECTED", the diver's bubbles, etc. 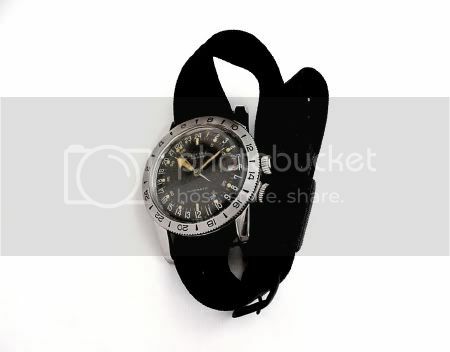 I emailed Ollech & Wajs, and they replied with a picture of the watch in its more familiar guise, so no new information there. Does anyone know anything else about this variant of the Early Bird?